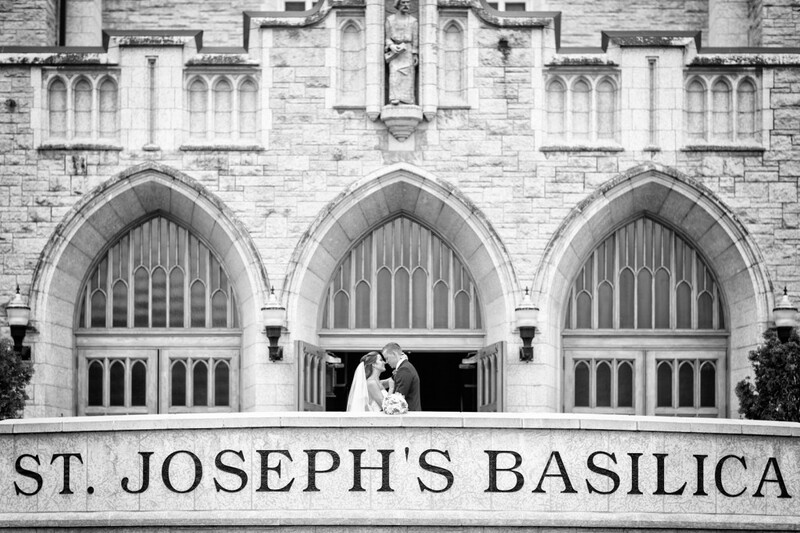 Kristin and Wyatt’s beautiful St Joseph’s Basilica wedding was full of love, family and fun. Guests gathered to witness these two sweethearts exchange their vows, and promise to love and care for each other. We first met Kristin and Wyatt on a snowy November evening. They were a sweet couple madly in love and excited for their wedding. In the early spring we met up again for their engagement photos. It was at this time that we were able to meet their newest addition to the family, a loveable pup named Zoe. You can check out Kristin and Wyatt’s engagement session here. Kristin and Wyatt’s wedding ceremony was held at St Joseph’s Basilica in downtown Edmonton. Surrounded by breathtaking stained glass windows, and the hum of the church organ it was a true Catholic wedding. Kristin and Wyatt exchanged their vows and shared their first kiss as husband and wife. The wedding party had an awesome time hanging out downtown where we had the best of both backdrops – downtown urban Edmonton and the beautiful river valley. Kristin and Wyatt wanted to make sure that their wedding day was more than just a ceremony. They wanted it to be a day of celebration with a really big party. Our first stop after the ceremony was the Edmonton Earls Tin Palace where the wedding party enjoyed a few drinks. The elegant wedding reception was held at Edmonton’s Woodvale Facility & Golf Clubhouse. Guests were treated to a beautifully catered meal, heart-felt speeches and a pyramid of delicious cupcakes. Kristin and Wyatt got their wish with an epic and energetic dance party that lasted well into the night! Thank you for inviting Deep Blue Photography to be part of your beautiful wedding! The Basilica in Edmonton is an iconic Catholic Church with beautiful stained glass windows, massive arched ceilings and a tremendous pipe organ. If you are planning a Catholic wedding ceremony in Edmonton, you cannot go wrong with the Basilica!